Los Angeles is synonymous with summer … living in the Hollywood Hills means sometimes you just need to add the beach to the equation. 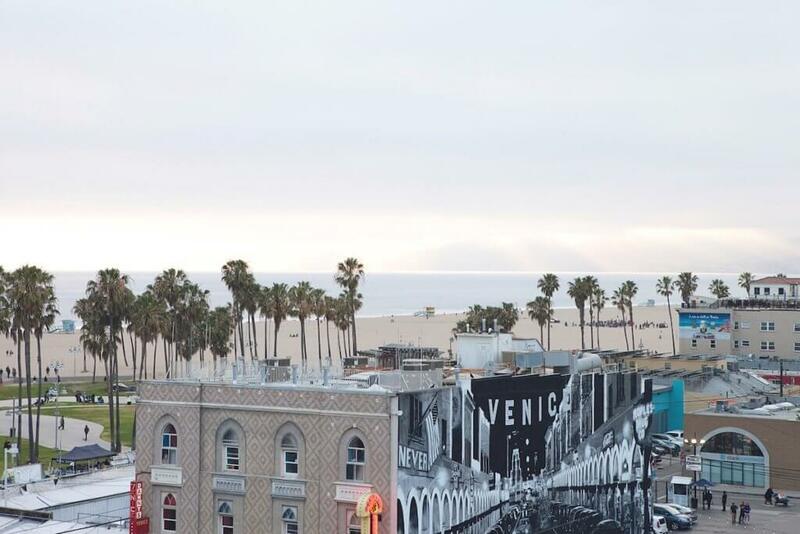 One of my favorite day trips is Venice Beach. It’s got a flavor all its own and only 30 minutes away …when there’s no traffic (which is never) … or 2 hours when the I10 is bumper to bumper. Nevertheless its always worth the trip. Here are a few of the sights I like to hit to get the very most out of my visit. Let me know your favorites in the comments below. First stop (after searching for parking) is a great latte or cup of coffee, I love Menotti’s. I was strolling around checking out the little beach shops one morning when I smelled the delicious aroma of coffee in the air. I followed my nose and ended up at Menotti’s. It’s a small, charming and they know how to make a great latte, complete with latte art. There are tables inside but when it’s not too hot I love to grab one of the little cafe tables outside and watch the people go by while I sip …trying to decide if I can handle just one more latte without getting the jitters. Next stop, Muscle Beach. Why bother coming to Venice Beach if you don’t check out the body builders right? I only wish I had 1/2 the will power they must have to keep their bodies in tip top shape, clearly I love my chocolate, lattes and cocktails more. While I was strolling around Venice I ran into TheMuscleupKing and Ike Catcher, check out the photo below, they live next to the beach and clearly demonstrate why Venice Beach is called “Muscle Beach”. If you feel up for it, you can always challenge them to a push up contest …I’ll just go get another latte. You can see Muscle Beach regulars The Muscleup King and Ike Catcher, like I did. Once you’ve strolled, shopped, people watched till you just cant take it anymore its time to head to the coolest rooftop retreat. I actually hesitate to mentions this because seating is limited and reservations are already hard to get so this will just be our little secret …Shhhhhhhh. Head to the Hotel Erwin, act like you own the place, smile at all the bouncers and take the elevator to the High Lounge on the rooftop. You’ll be greeted by one of the most stunning views in the entire area. On a great day you can see all the way to Malibu. Fear not its not just an over priced pretty face, the food and drinks are phenomenal and the staff is oh so sweet. 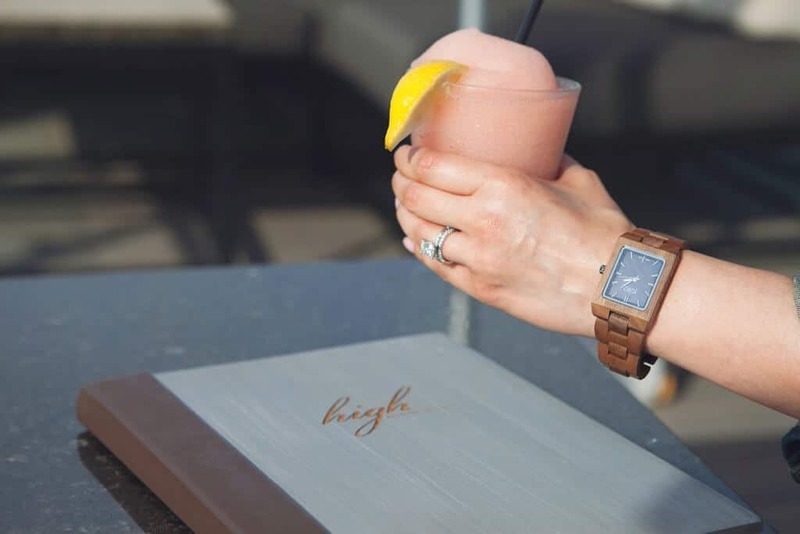 After viewing the sunset at the High Lounge its impossible not to try and book at table for EVERY summer day. Its that good. Lucky for me there are a ton of gluten free nibbles to snack on while watching the sun slowly dip behind the mountains. My favorites are the guacamole and street tacos (you know I love my Mexican food), but there are always several tasty options to choose from. As for drinks, they’re all good but a stellar standout is the new Frosé. Check this place out but make reservations and be prepared to still wait in the line. This was a cloudy day, but the view from High Lounge is still amazing. Not sure if you noticed in my photos, but I found a new unique watch that I love. I think it absolutely screams “SUMMER” so I had to take it for a spin. I caught quite a few people checking it out. 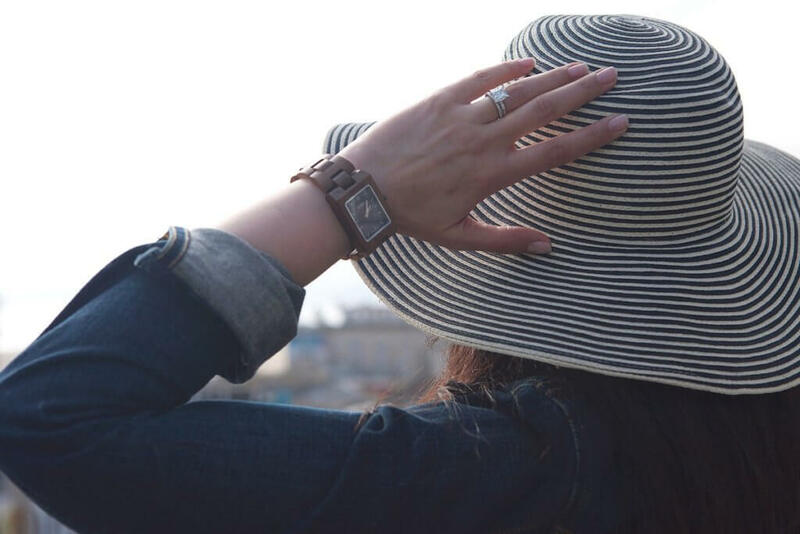 I’ve always loved watches as statement pieces for my outfits. 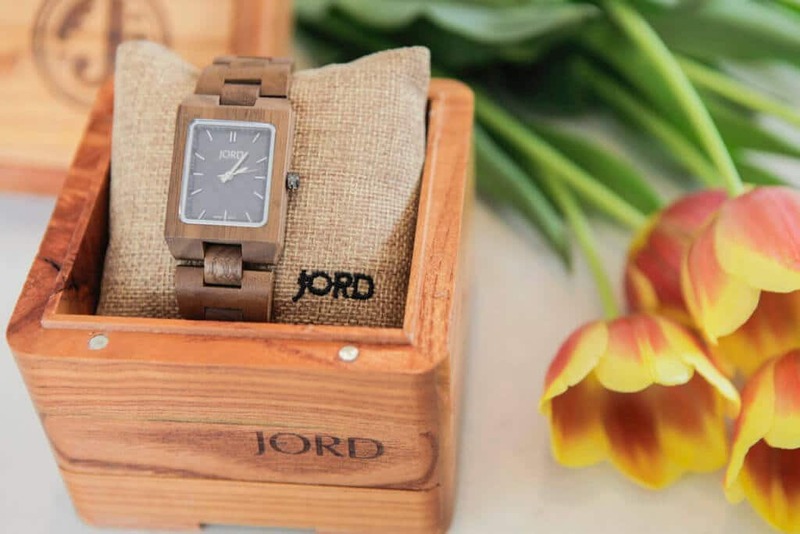 I recently learned about Jord Watches (pronounced YODE) and I was instantly enamored with them. 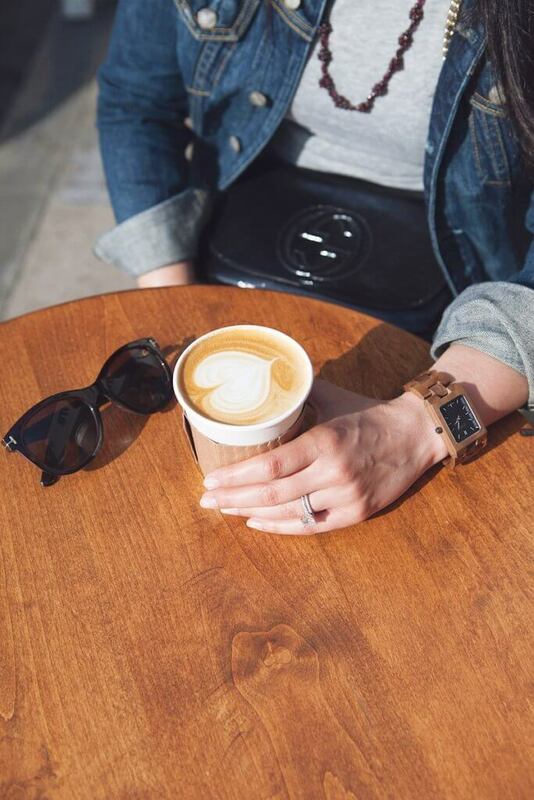 Their time pieces are one-of-a-kind, beautiful and well-made. They make options for both men and women, so they make a great gift option. 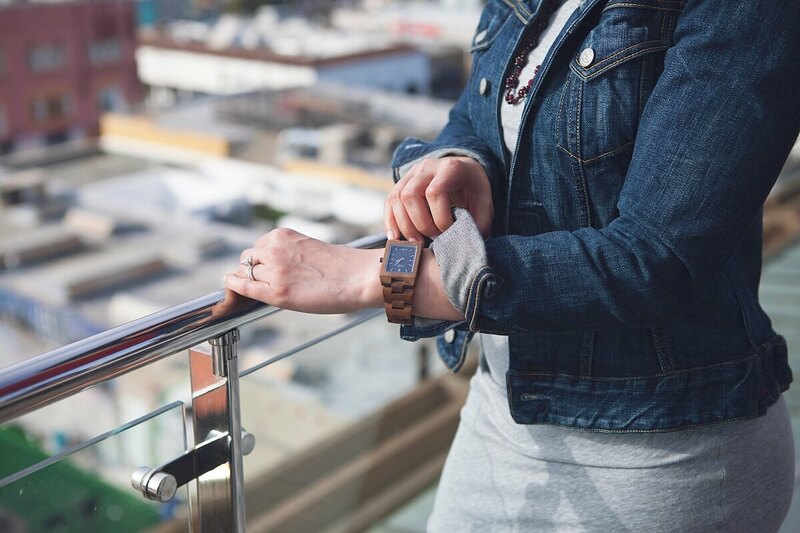 I’m wearing the REECE series in Walnut & Navy, and it’s the perfect choice for me. The box that it comes in and the watch are works of art. Such a unique watch, and it goes with everything.